Fly with the best! Evil from a galaxy far, far away. 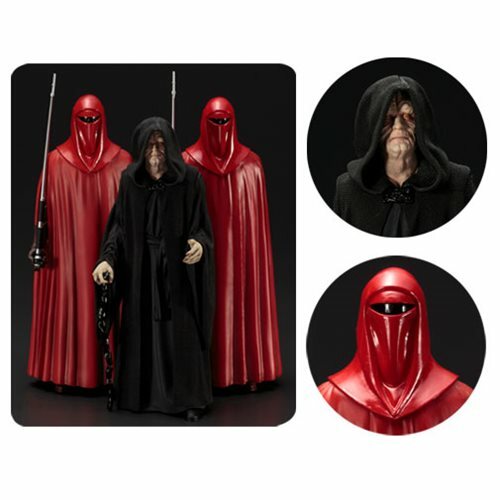 The Star Wars Emperor Palpatine and Royal Guards 3-Pack ArtFX+ Statues includes Emperor Palpatine himself along with two Royal Guards. The Royal Guards are from the same mold as the previously released ArtFX+ Royal Guard 2-Pack, which makes this a great opportunity for fans and collectors who missed their chance to purchase this popular item. Each PVC/ABS statue is in 1:10 scale ArtFX+ and are perfect for solo display or alongside other Star Wars ArtFX+ statues (sold separately). Each statue measures about 5 1/3-inches tall and come packaged in a closed box.